A medium chestnut brown color, delicate fruity bouquet and a robust, malty character. Combines traditional Challenger hops from the English region of Kent and a special blend of select carastan and black patent malts. Pours dark brown, with an impressive white head that left great lacing down the glass. Aroma is fruity and malty. Medium body, and flavours of caramel and a hint of roasted malts. 341 ml bottle @ Cascades Lounge Holiday Inn Yorkdale, TO. Pours a clear chestnut brown with a large reddish tinted head. Aromas are raisin and maybe a little bread. Tastes are big roasty malts, some nuts, and a subdued hop bite on the back end. Medium body, assertive carbonation, medium bready finish. Nice beer. UPDATED: MAY 5, 2017 11.5 ounce bottle into pint glass, bottled on 9/16/2016. Pours fairly crystal clear deep ruby red/light brown color with a 1-2 finger dense and rocky cream colored head with good retention, that reduces to a small cap that lingers. Nice spotty soapy lacing clings down that glass, with a fair amount of streaming carbonation. Aromas of caramel, brown sugar, brown bread, toasted biscuit, nuttiness, herbal, floral, and grass; with lighter notes of chocolate, coffee, toffee, pepper, raisin, plum, apple, and yeast/roast/toasted earthiness. Nice and pleasant aromas with good balance and complexity of dark/bready/light roasted malt and light-moderate fruity yeast/earthy hop notes; with solid strength. Taste of caramel, brown sugar, brown bread, toasted biscuit, nuttiness, herbal, floral, and grass; with lighter notes of chocolate, coffee, toffee, pepper, raisin, plum, apple, and yeast/roast/toasted earthiness. Light herbal/grassy/spicy hop and roast bitterness on the finish. Lingering notes of caramel, brown sugar, brown bread, toasted biscuit, nuttiness, herbal, floral, grass, pepper, light chocolate/coffee, and yeast/roast/toasted earthiness on the finish for a good bit. Nice complexity, robustness, and balance of dark/bready/light roasted malt and light-moderate fruity yeast/earthy hop flavors; with a great malt/bitterness balance, and zero cloying flavors after the finish. Light dryness from hop/roast bitterness, increasing through the glass. Medium carbonation and body; with a very smooth, moderately creamy/bready/grainy, and lightly sticky/chalky balanced mouthfeel that is nice. Zero warming alcohol as expected of 5%. Overall this is a nice English brown ale. All around nice complexity, robustness, and balance of dark/bready/light roasted malt and light-moderate fruity yeast/earthy hop flavors; very smooth and easy to drink. There was a bit of an odd stale grain note going on, but this was really spot on for the style otherwise. A nicely enjoyable offering. Bottled. Dark body with an even beige head. The aroma is very malty and roasted. The taste is quite strong but slightly bitter. Very unbalanced. Tried the blind taste test and it had similiar taste to Guinness but was not as thick and creamy as that. Good flavour. More of a brown than a dark ale. Taste is not as heavy as you would expect. The best description is restrained and balanced. Nice hints of fruit, nut and hop mix. I enjoy this beer. Clear dark reddish brown with a small tan head. Nose is roasted nuts with light coffee and chocolate. Light sweet with a light bitter middle and an acidic finish. Light medium mouth with soft carbonation. Dark amber brown pour with very little head. Mainly just a sweet malt taste, some hops but not prominent. Medium thin body. Bottle. This is actually an acceptable brown ale; decent chocolate character. Clear and dark brown. 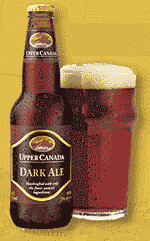 Better than other "discount brand" dark ales; okay for the price.